Did you know that environmental laws, labor and women once clashed, causing feathers to fly? One little known battle from the days of the “plume boom” took place in 1913. The setting? The Indiana State House. Nineteen-thirteen happened to be the same year that W.T. Hornaday, one of America’s foremost wildlife biologists and conservationists, published a book called Our Vanishing Wildlife. Born on a farm near Plainfield west of Indianapolis but raised in Iowa, Hornaday had traveled around South Asia, served as Chief Taxidermist at the Smithsonian, then became the first director of the New York Zoological Society, later renamed the Bronx Zoo. In 1889, the former Hoosier published the first great book on the near-total destruction of the American bison — the species seen bounding across Indiana’s state seal but which was wiped out here long ago by the pioneers. From the trackless jungles of New Guinea, round the world both ways to the snow-capped peaks of the Andes, no unprotected bird is safe. The humming-birds of Brazil, the egrets of the world at large, the rare birds of paradise, the toucan, the eagle, the condor and the emu, all are being exterminated to swell the annual profits of the millinery [hat-making] trade. The case is far more serious than the world at large knows, or even suspects. But for the profits, the birds would be safe; and no unprotected wild species can long escape the hounds of Commerce. Feathers have been part of human attire for millennia. But by the early 1900s, massive depredations by European and American hunters around the globe had wreaked havoc on avian populations. Bird hunters were now the arm of industrial capitalism, with the harvesting of birds for ladies’ hats belonging in the same category with other natural resources like coal, diamonds and oil. 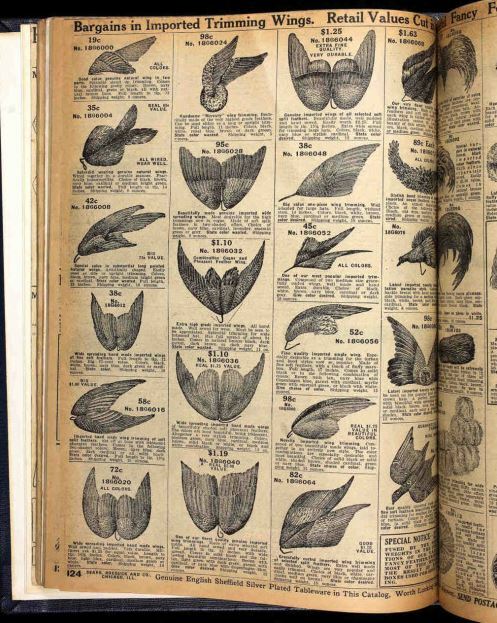 Although the center of the global feather trade in 1913 was London — where feather merchants examined skins and quills in enormous sales rooms, then bid on them like other commodities — New York and Paris were involved a big part of the trade. 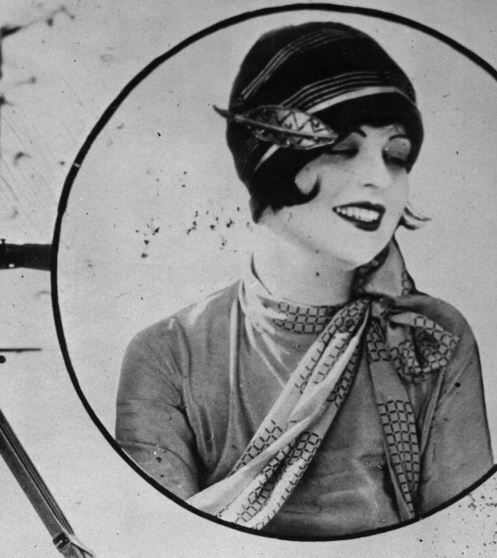 All three cities had become epicenters of women’s fashion. And women weren’t only the consumers of feathers: of the roughly 80,000 people employed in the millinery business in New York City in 1900, the majority were women. In 1892, Punch, the British satirical magazine, took a jab at women, who it considered the driving force behind the decimation of wild bird species and their consumption in the West. It failed to point out, of course, that the hunters themselves — the ones who did the slaughtering — were men. 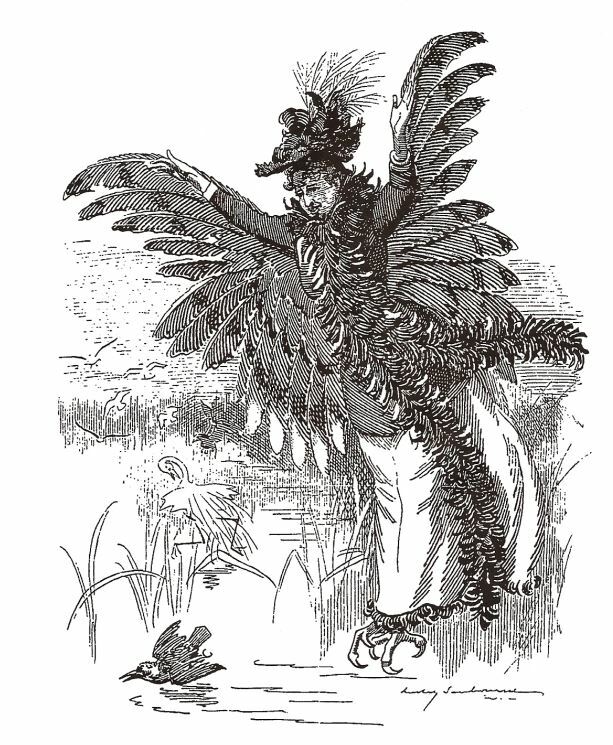 “A Bird of Prey,” Punch, May 14, 1892. 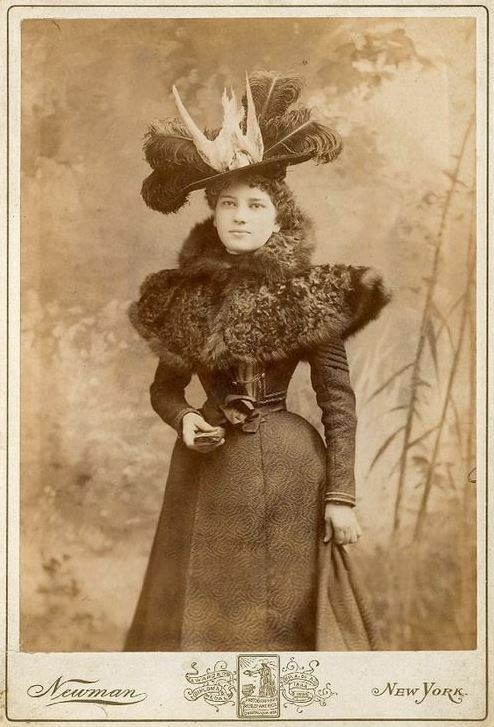 Woman with an entire bird in her hat, circa 1890. Late-Victorian and Edwardian fashions led to the deaths of several hundred million birds in the days before state, national, and international laws stepped in to help prevent the extinction of many of them. A moral crusade among consumers and nature-lovers — as well as changing fashions — were even more important factors. In the U.S. and Europe, bird-lovers created several societies to stem the global slaughter, with scientists helping to provide the grisly details that would provoke moral outrage. Women made up most of the membership in these societies, including the new Audubon Society — named for John James Audubon, the French-American naturalist who lived for years along the Ohio River across from Evansville, Indiana. An especially well-known voice was the great ornithologist and writer William Henry Hudson, born to American parents in Argentina, where he spent his childhood bird-watching in the South American grasslands. Yet in the days before zoom lenses and advanced photography came along, even respected field naturalists like Audubon and Hudson had relied on guns to “collect” species and study them. In 1913, W.T. 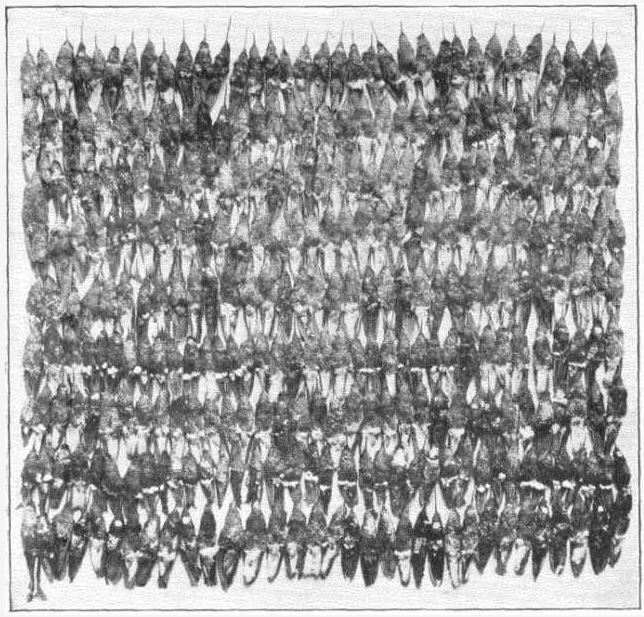 Hornaday gave specifics on the “plume boom.” At one London feather sale two years earlier, ten-thousand hummingbird skins were “on offer.” About 192,000 herons had been killed to provide the packages of heron feathers sold at a single London auction in 1902. Other popular feathers came from birds like the egret, eagle, condor, bustard, falcon, parrot, and bird of paradise. When exotic bird feathers weren’t available or affordable, millinery shops used the feathers of common barnyard fowl. Hummingbird skins at a millinery sale, August 1912. While the Florida Everglades were a popular hunting ground, the “Everglades of the North” — Indiana’s Kankakee Swamp, now mostly vanished — was another commercial source for feathers, mammal pelts, and another item that’s out of fashion today: frog legs. Yet the worst of the commercial hunting was in Florida, where ornithologists wrote of how hunters shot mother birds, especially herons and egrets, and left nestlings to starve, endangering the entire population for quick profit, as the mother’s plumage was at its most spectacular during nursing. Conservationist T. Gilbert Pearson described finding “heaps of dead Herons festering in the sun, with the back of each bird raw and bleeding” where the feathers had been torn off. “Young herons had been left by scores in the nests to perish by exposure and starvation.” The much-publicized murder of a young Florida game warden, Guy Bradley, in 1905 helped galvanize the anti-plumage campaign and spurred the creation of Everglades National Park. Since bird feathers and skins were often valued at twice their weight in gold and were readily available to ordinary Americans and Europeans even in urban areas, women and children found a decent supplemental income in stoning birds to death or killing them with pea-shooters, stringing them up, and selling them to hat-makers. Children also robbed eggs for collections. Farmers frequently shot or trapped even great birds like the eagle when they preyed on chickens, with one scowling, utilitarian farmer in New Hampshire blasting “sentimentalists” who thought the eagle had “any utility” at all. 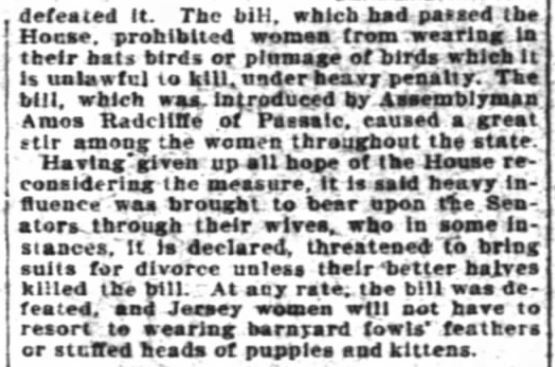 By 1913, legislators in the U.S. and Britain had been urged to consider “anti-plumage” bills. Yet the profits involved in millinery — and the ability of consumers to buy hats in markets not covered by the laws — were big hurdles. As early as 1908, anti-plumage bills were being debated in the British Parliament, but they took years to pass. (Britain’s passed in 1921.) States like New York and New Jersey were considering a ban on the trade in wild bird feathers around the same time. New York’s went into effect in July 1911, but not without concern for its effects on feather workers, some of whom argued that they had no other way of supporting themselves. The debate in New Jersey took a more comic turn. 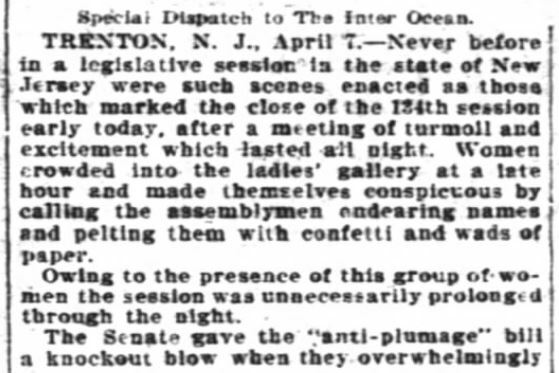 If this news account can be trusted, women came to the Senate in Trenton and pelted legislators with paper balls. The Inter Ocean, Chicago, April 8, 1910. Seymour Daily Republican, January 25, 1913. 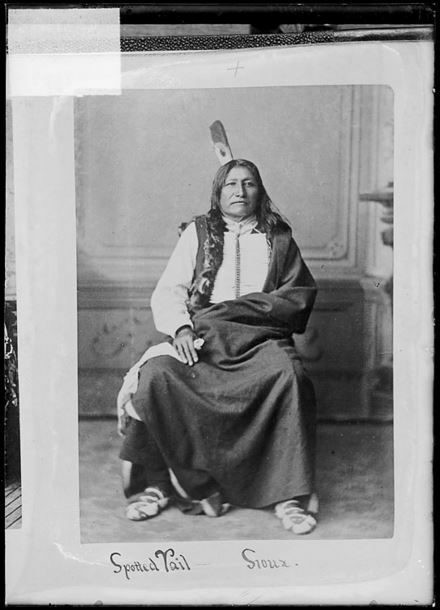 Spotted Tail, Brulé Lakota Indian chief, liked feathers on his head. Voris returned to the Midwest, settling in Crawfordsville, where he was a member of General Lew Wallace‘s “noted rifle team,” a group of crack recreational sharpshooters. (The Hoosier soldier, ambassador and author of Ben-Hur was also an avid hunter and fisherman, often visiting the Kankakee Swamp.) Voris’ obituary noted that the mayor “was a man of peaceful disposition in spite of his love for firearms.” He knew about animals: his investments in livestock and insurance made him one of the richest men in Crawfordsville. He also served as postmaster and was involved in civic-minded masonic organizations, including the Tribe of Ben-Hur, Knights of Pythias and Knights Templar. General Wallace, former U.S. Ambassador to the Ottoman Empire, probably had something to do with the fact that in 1898, Voris was granted an audience with the Turkish Sultan while traveling in the Middle East. Voris apparently loved camels, too: in 1914, he fell off one in Crawfordsville when the camel got spooked by an automobile. The man landed on his head and suffered a scalp wound. The “Voris bird bill” won strong support from conservation and animals rights groups in the Hoosier State, but sparked a bit of humor on the floor of the House of Representatives. 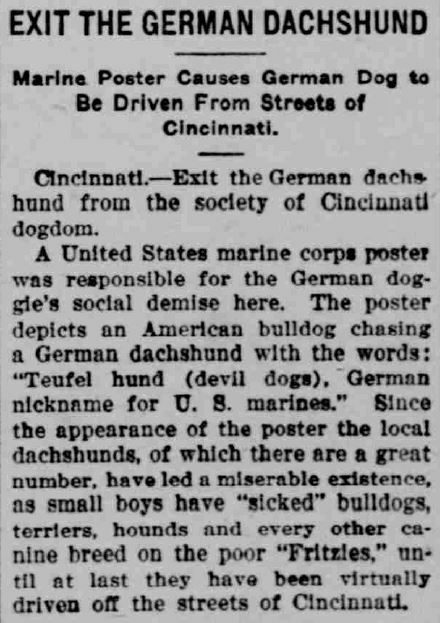 Indianapolis News, February 4, 1913. Ostrich feathers often came from farms in South Africa, where Jewish feather merchants dominated the trade. Jews and women also led the millinery business in the U.S. In 1870, hat-making was the fourth-largest employer of American women. 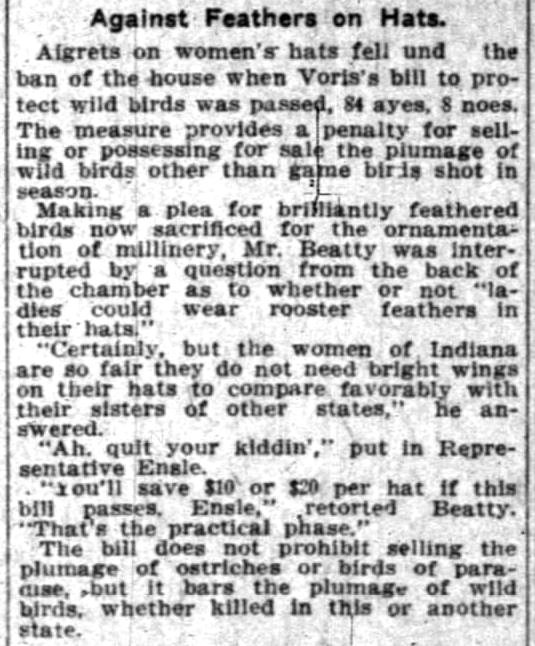 The “Voris bird bill” passed the Indiana House, but objections arose in the Senate, with a Senator Clarke arguing that it would harm Indiana milliners while not prohibiting the sale of hats made outside the state from being sold here. Another senator objected on the grounds that national legislation was needed to make it truly effective — even though that was slow in coming. The bird bill was killed in February. 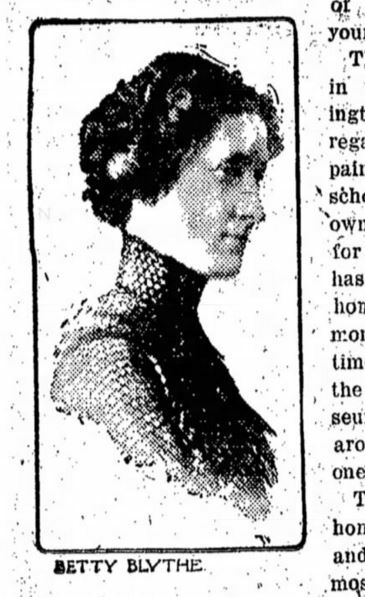 Yet while some women opposed it, one correspondent for the Indianapolis Star came out in defense of the anti-plumage campaign. Marie Chomel, who wrote under the pen name Betty Blythe, had a weekly column in the Indianapolis Star for years. (She came from a newspaper family. Her father Alexandre Chomel, son of a nobleman exiled by the French Revolution, had been the first editor of the Indiana Catholic & Record.) As a reporter for the Star, Betty Blythe became the first woman ever to lap the Indianapolis Motor Speedway in a race car, riding shotgun with Wild Bob Burman “at a terrific speed” on a day when two drivers were killed there. It happened in August 1909. Chomel frequently wrote about fashion, but thought that exotic plumage was inhumane and had to go. She published her views on the bird bill in the Star on February 13, 1913. “Our Lawmakers as Betty Blythe Sees Them,” Indianapolis Star, February 13, 1913. Chomel agreed with Voris’ motives. Yet like English novelist Virginia Woolf, who criticized a sexist statement from British radical journalist H.W. 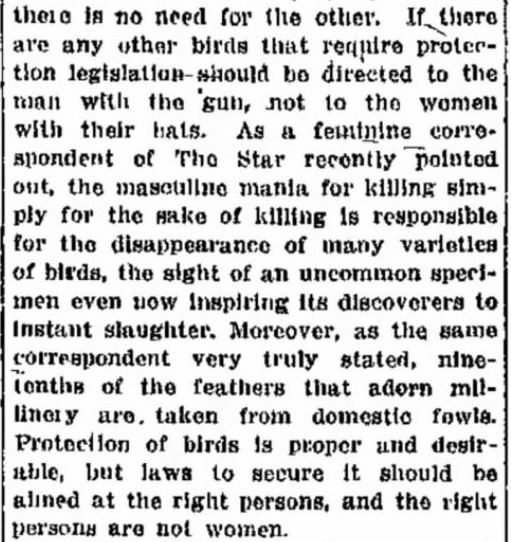 Massingham that pinned the blame for bird deaths squarely on irresponsible women, the Indianapolis Star didn’t let men off the hook, either. 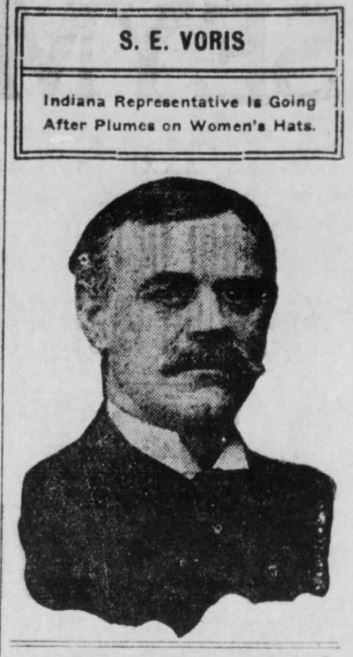 Indianapolis Star, March 3, 1913. The “feminine correspondent” was probably Betty Blythe. Though wildlife protection laws and groups like the Audubon Society helped make the case for saving birds, two other events were even more influential in ending the feather trade. Oddly, the outbreak of World War I saved millions of birds. Disruptions to international shipping and wartime scarcity made the flamboyant fashions of the Edwardian period look extravagant and even unpatriotic. Tragically, as women went into the workplace and needed more utilitarian clothing, “murderous millinery” gave way to murderous warfare, fueled by the same forces of imperialism and greed that had killed untold creatures of the sky. 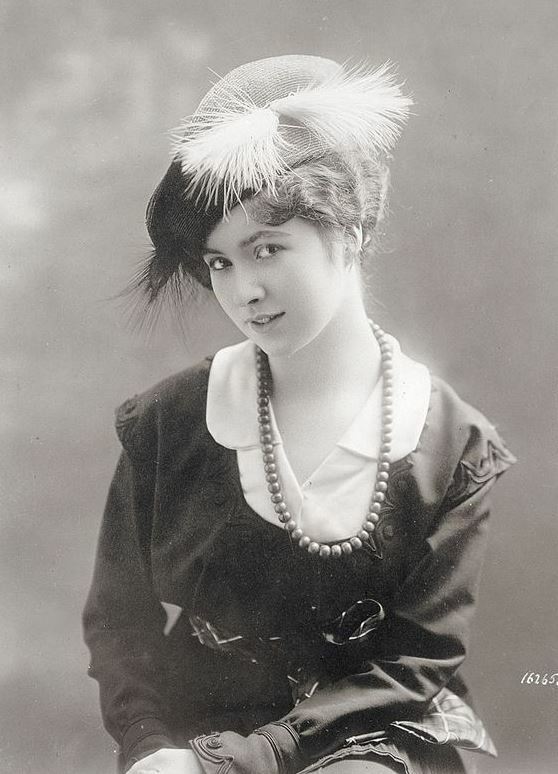 Even more effective, fashion changes and class antagonism caused upper-class women to adopt new apparel like the “slouch” and “cloche” hats and new hairstyles like the bob. As hair was being cut back, elaborate feather ornaments made little sense. In the U.S. and the UK, where upper-class and upper-middle-class women made up most of the membership in groups like the Audubon Society, female conservationists sometimes targeted women of other classes for sporting feathers. Slowly, they instigated change. Fortunately, most fashion enthusiasts would probably agree that the cloche hats of the 1920s, which drove hunters and feather merchants out of business, are more natural and beautiful than the most literally “natural” hats of a decade or two before. The cloche hat of the 1920s and ’30s spelled extinction to commercial bird hunters. Yesterday’s post sent a few heads rolling, but we can’t get enough this October. Here’s a follow-up from medical science. Contrary to popular belief, Washington Irving didn’t invent the tale of Ichabod Crane and the Headless Horseman from scratch. 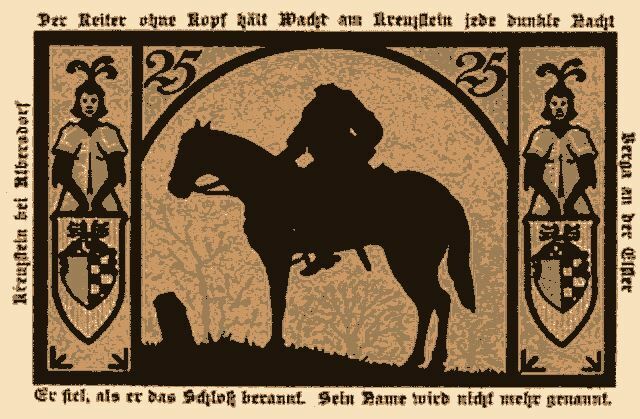 Said to have been a Hessian mercenary decapitated by a cannonball during the American Revolution, the dark rider was left to roam the Catskill Mountains near a Dutch settlement in New York called Sleepy Hollow. Written while Irving was living in Europe, the story actually drew on German and Irish folklore, where similar specters haunt the realm of the living. There’s also a long list of early Christian saints (known as cephalophores) who according to hagiographic legends, picked up their own heads after execution and walked away — or at least uttered an important message before going silent at last. Saint Gemolo, who probably came from Germany or Scandinavia, was even said to have grabbed his head in his hands and ridden away on horseback. Germans told of Der Kopfloser Reiter, a shadow figure that rides out of the forest, hunts down malefactors, warns the living, and — like his cousin the Irish banshee — announces the approach of death. 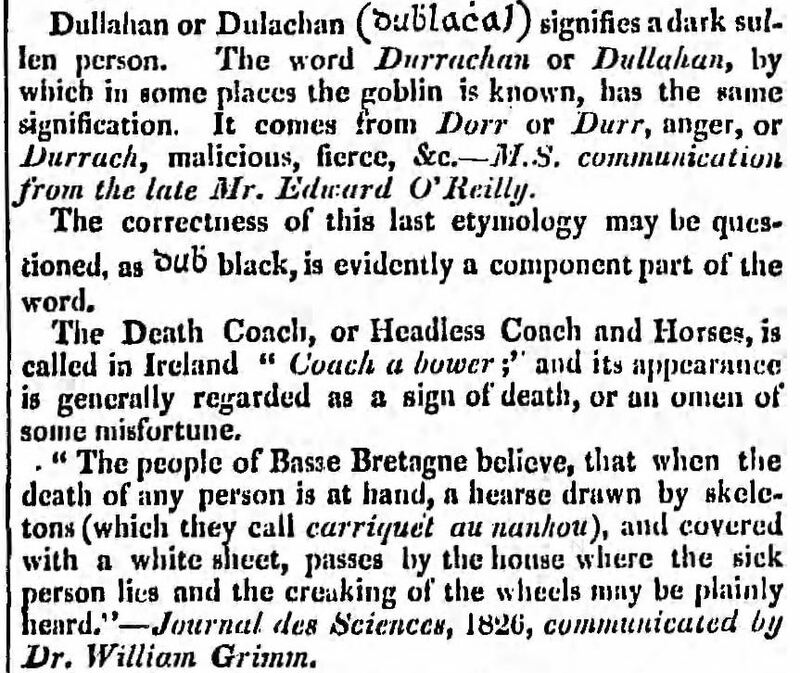 Irish folklore includes reports of the dulachán or dullahan, a specter that also rides a dark horse, but he comes with some frightening accouterments: a whip made from a human spinal cord, a funereal bone cart. . . Like the screaming banshee, the apparition of a dullahan portends encroaching death. And like Washington Irving’s horrid creature, the dullahan carries its own severed head, believed to look like moldy cheese. Don’t look at the specter to find out: he’ll throw blood in your face. The Dublin Penny Journal, November 22, 1834. 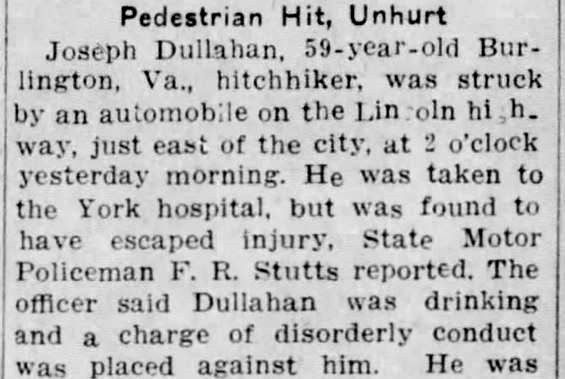 Terre Haute Tribune, April 11, 1948. The Gazette, Stevens Point, Wisconsin, March 25, 1908. Amazingly, Dullahan is also an Irish surname. The Gazette and Daily, York, Pennsylvania, December 25, 1939. With the mass emigration of Irish peasants overseas, especially after the brutal Famine of the 1840s, these stories got carried to the U.S. Some were twisted into hyper-literary forms. But apparently the actual banshees didn’t care for transatlantic sea voyages and stayed home in their native terrain. Headless horsemen, though, weren’t totally fictional. 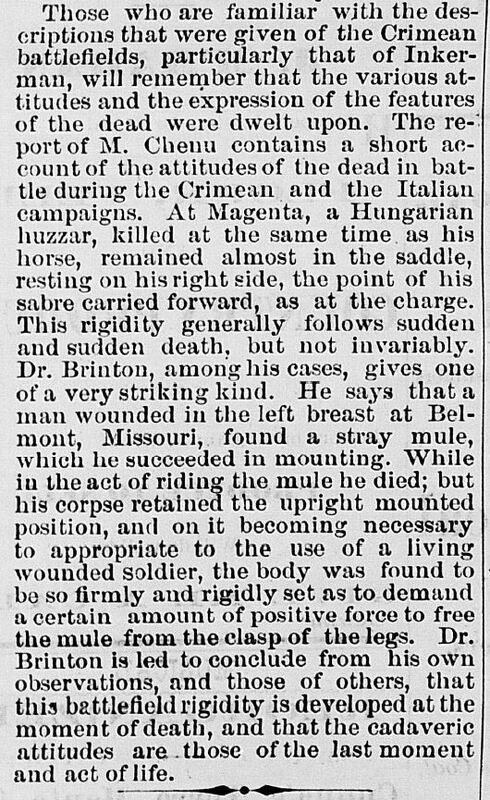 In 1870, doctors in England offered a rational explanation for what were actually real sightings of decapitated equestrians. These sightings, of course, occurred in war zones. Readers of the Terre Haute Weekly Gazette encountered the following clip from The Lancet, a famous London medical journal. Founded in 1828, just nine years after Irving’s Sleepy Hollow came out, The Lancet was the brainchild of Thomas Wakley, a crusader against “incompetence, privilege, and nepotism” in British society — and flogging. The doctor was also a radical Member of Parliament. Wakley’s sons edited The Lancet until 1909. 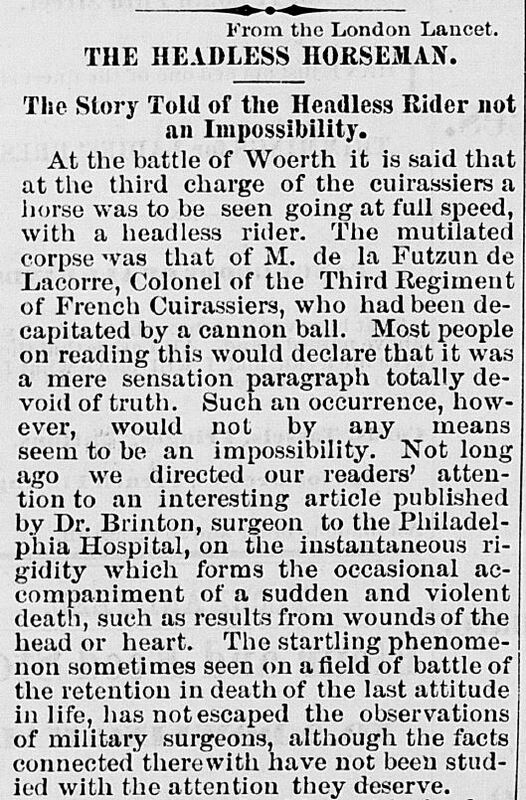 The medical clip sought to explain a bizarre event during the Franco-Prussian War. On August 6, 1870, at the Battle of Wörth in the Rhine Valley, a headless French horseman was spotted “going at full speed” across the battlefield. The Lancet’s explanation came out a month later on September 3. Terre Haute Daily Gazette, September 29, 1870. A letter to the editor sent as a follow-up and signed by Logan D.H. Russell appeared in the British magazine in January 1871. 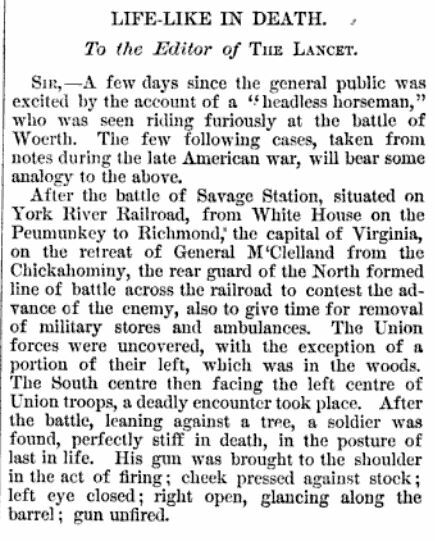 Dr. Russell gave a few examples of “life-like” rigidity in death witnessed by doctors, nurses, and soldiers during the American Civil War. Scientific investigation into these aspects of post-mortem physiology continued during the 20th century. Though farmers and any homeowner with poultry in the back yard knew that “headless chickens” were no myth — the skeletal anatomy of chickens really do allow them to live briefly after decapitation — newspaper readers in 1912 were surely surprised to hear that a French surgeon in New York City had successfully performed experiments allowing headless cats to survive for another three days. The Marion Weekly Star, Marion, Ohio, December 7, 1912. This surgical revolution was the work of Alexis Carrel (1873-1944), one of the more unusual and forgotten pioneers of surgery. Oddly, before he began experimenting on cats, Carrel’s scientific work took him into the realm of what most scientists consider superstition and folklore: divine healing. Raised in a devout Catholic family, Alexis Carrel fell away from religion as a young medical student. In 1902, however, pressured by a colleague, he traveled to Lourdes in southwestern France to see something unusual. Lourdes was a mountain town in the Pyrenees made famous in the 1850s by apparitions of the Virgin Mary, who allegedly came and spoke to a French shepherd girl there for weeks on end. French scientists and secularists, calling it a fraud, tried to have Lourdes shut down under public hygiene laws after thousands of suffering believers came in search of a cure — which, incredibly, they often found. For decades, reports of miraculous healings attributed to mineral waters from the caves and to divine intervention plagued, even embarrassed, European doctors and intellectuals. 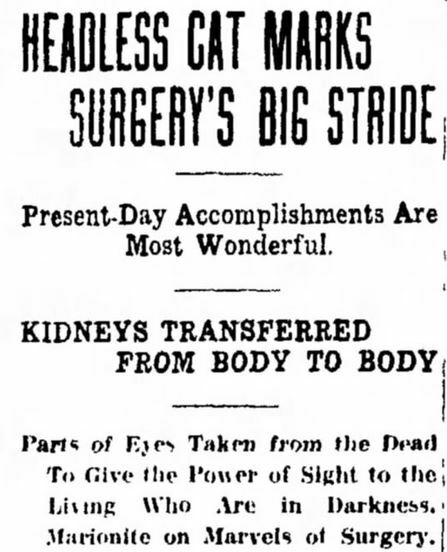 In 1902, Alexis Carrel saw one of these miracles as it was happening: the sudden and complete healing of a tubercular patient given up for dead. Decades before the discovery of antibiotics, Marie Bailly, the patient, was soon declared totally free of her disease, which she was expected to die of at any moment. She became a nun and lived for another thirty years. Carrel, an agnostic, claimed that he actually watched her body undergo a healing transformation at Lourdes. The young doctor delivered some of the main eyewitness testimony about the miracle — which led to his being banned from working in French hospitals and universities. With his reputation destroyed, Carrel emigrated to Canada, where he became a cattle rancher and farmer. Later coming to the U.S., he taught at the University of Chicago and the Rockefeller Institute in New York. Over the next few decades, Carrel became a pioneer in the field of vascular suturing techniques. Helped by aviator Charles Lindbergh, he invented the perfusion pump, used to preserve organs during transplantation. For his work in human physiology — partly involving experiments on headless cats — Carrel won a Nobel Prize in 1912. 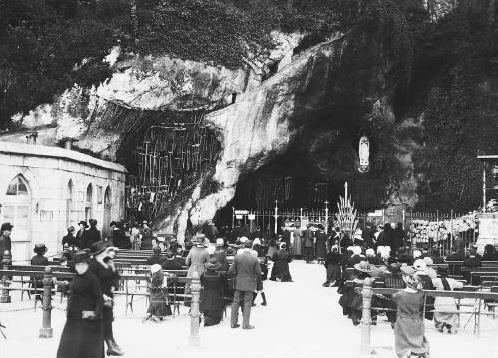 Still baffled by the bizarre cure he witnessed at Lourdes, Carrel never retracted his belief that Marie Bailly was healed by a supernatural force, an event so strange that one writer believed it drove him mad. His book about the Lourdes miracle, written in 1903, was only published in 1949, five years after his death. Lourdes Grotto, scene of some mysterious medical phenomena. 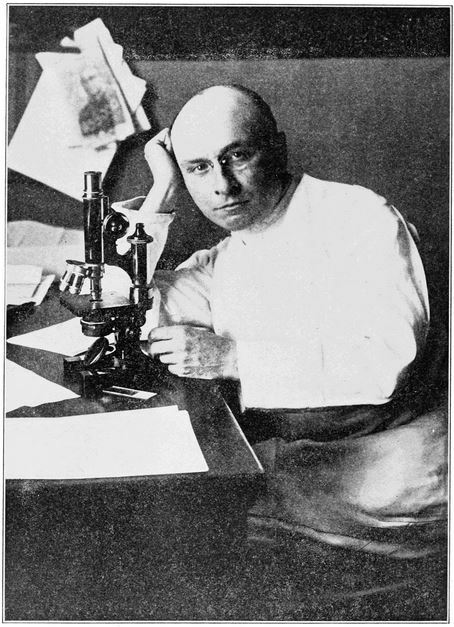 As a prelude to the Nazis’ perversion of science, Dr. Alexis Carrel went on to publish a bestselling book, Man, the Unknown (1935). The Nobel Laureate even joined an anti-Semitic French fascist party, the PPF. During Hitler’s occupation of France, Carrel helped put eugenics laws into place under the Vichy collaborators. If he hadn’t died in 1944, the doctor would probably have been put on trial as a traitor or war criminal. All of which is further proof that scientists — like Hessian horsemen and everybody else — can lose their head. The Fort Wayne News, Fort Wayne, Indiana, December 6, 1912. Terre Haute Tribune, January 6, 1951. So begins an article in the Greencastle Daily Banner, September 11, 1940. In a meeting that week, Putnam County commissioners finally eliminated payment in cash for the hides of animals deemed “pests of economic life.” On the eve of World War II, this legal relic of pioneer days was still lingering around in the statute books. In recent years, the expenditure on such bounties has not amounted to much, but the bounty offer was still in effect and occasionally some claimant for such payments would go to the auditor’s office to file claims for payments, and would bring along tangible proof. Out of which arose the odor. 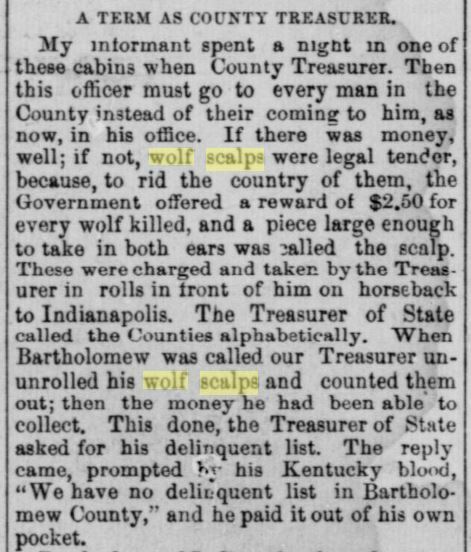 The statutes of Indiana in 1875 [it was actually much earlier than this] provided that county commissioners “may” offer a bounty of $20 for wolf scalps, with a $3 bounty of wolves under 6 months of age; also, $5 for each fox scalp; or $1.50 when under 6 months. 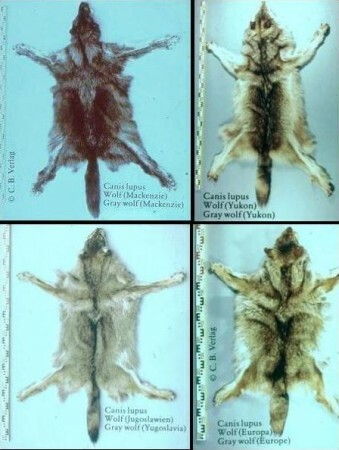 A year or two ago, Putnam County commissioners were called upon to pay a bounty for a wolf scalp. In a later law, a bounty was provided for wood chuck (or ground hog) scalps, and owl or hawk heads, but with screech owls and sparrow hawks excepted. That was in the year 1883. In 1911, crow heads and eggs were added to the list of outlaws, and a bounty was provided of 10 cents for each crow head and 5 cents for each crow egg, the eggs to be in lots of 10 or more. In 2011, no less a paper than The New York Times reported on Terre Haute’s recurring crow problem — a major ornithological nightmare that migrated down to Bloomington early in 2015. For months, urban crows left the Monroe County courthouse, downtown parking meters, and city sidewalks soaked in bird droppings. Surely this was avian revenge for the county commissioner’s bounties placed against their ancestors? 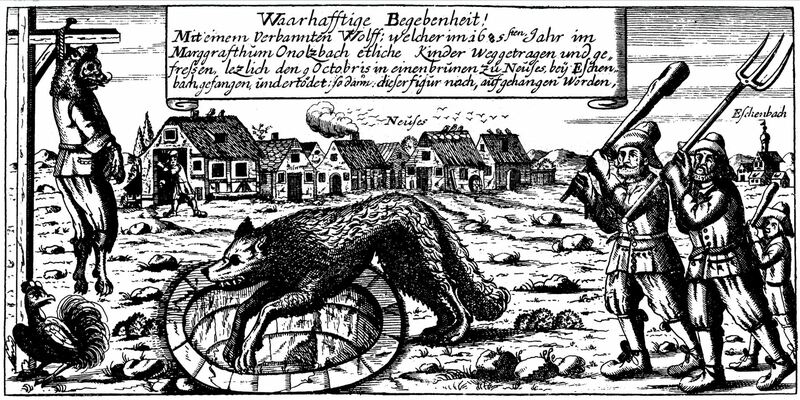 The interesting story of animal bounties goes back deep into Indiana history — as do the wolf terror tales that go along with it. When Indiana became a state just two-hundred years ago, the area bounded by the Ohio River, Lake Michigan, and the Illinois prairies was one of the wildest spots on earth, full of buffalo, black bears, and cougars. (Abraham Lincoln wrote a ballad about a bear hunt.) Old-growth timber could still be found in most Hoosier counties at the time of the Civil War. Though fur-bearing animals had been the main lure for French explorers, one of the French nuns who founded St. Mary-of-the-Woods in the 1840s wrote that “wood is commoner than dust.” In northwest Indiana, parts of the Kankakee Swamp — formerly one of the biggest wetlands in North America — weren’t drained until the 1920s. Modern agriculture in some northern Indiana townships is less than a hundred years old. At the start of the Jazz Age, the Kankakee’s ancient but dying wilderness was still a hideout for wolves. In 1918, the Lake County Times reminded readers about their fanged and rarely-seen neighbors on the far outskirts of Chicagoland. Gray wolves, Canada lynxes and possibly even massive timber wolves also occasionally migrated down from the wilder parts of northern Michigan. While these creatures tried to avoid human beings, swamp fires sometimes drove them out onto the farms encroaching on the ragged edge of the marshland. Lake County Times, January 26, 1918. Hoosier State Chronicles. By the early 1900s, the misunderstood canine specter peering out of Indiana’s diminishing forests and swamps was a rare sight — as were the mangled carcasses of farm animals that wolves were known to attack. 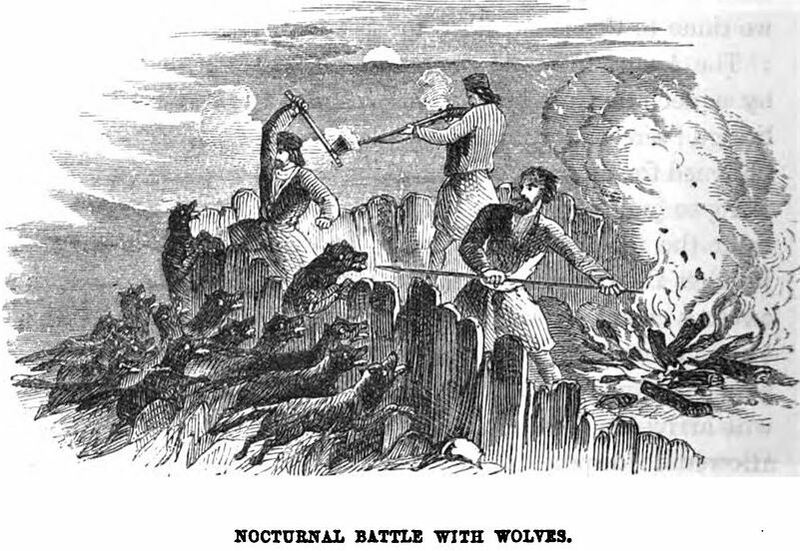 Yet the morbid imagination spawned by European folklore was brought into play to defend farmer’s property, as the war on wolves continued unabated in the American West. Hoosiers heard wolf tales stretching back hundreds of years — from the Grimm Brothers’ gory version of the old Black Forest tale Rotkäppchen (“Little Red Riding Hood,” later bowdlerized and Disneyfied for delicate audiences) to the quintessentially Russian tale of a pack of wolves that killed and ate a wedding party traveling by sleigh at night. That story was told in the pages of Willa Cather’s great novel My Ántonia (1918), set in Nebraska. In the early 1980s, Paul Schach of the University of Nebraska collected wolf stories brought to the Great Plains by German immigrants whose families had lived in Russia for a few generations before coming to America. Russian-German tales almost definitely inspired Cather’s miniature horror story in My Ántonia. 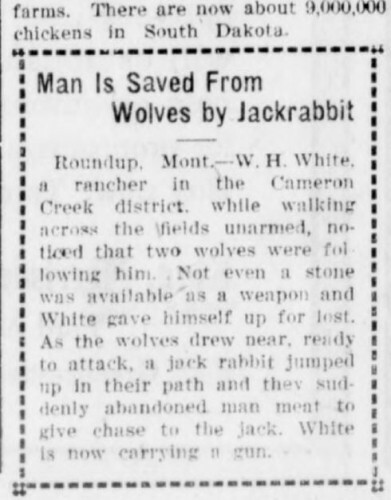 Yet American newspapers were already carrying chilling wolf tales long before Cather’s novel. 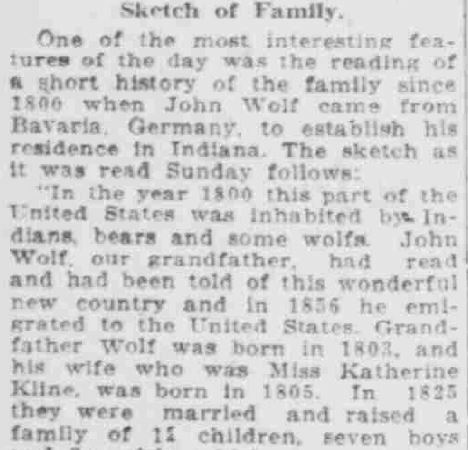 In the winter of 1880, Willa Cather’s old Russian “wedding” story found an echo in Terre Haute’s Daily News, which printed a pioneer’s reminiscence entitled “A Night with Wolves.” The tale, told in first person, sounds like non-fiction but the dialogue is dramatized. 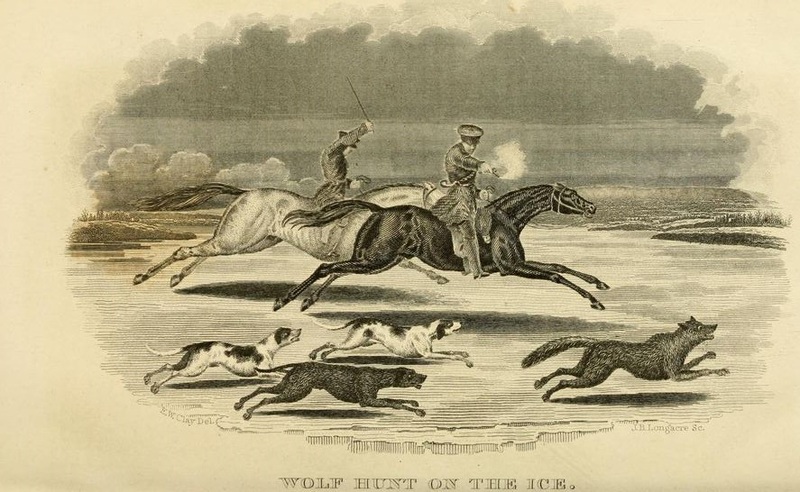 Set around 1845, the hair-raising event took place one frozen, snowy night in the Upper Midwestern wilds a few miles outside the young town of Lansing, Michigan, where the author claimed that a hungry pack of wolves attacked a stagecoach he was traveling in by moonlight. As the terrified horses race away in a panic, dragging the coach and passengers behind them, the driver — his father — climbs out on the reins to cut part of his team loose, letting them drop as sacrificial victims to the bloodthirsty wilderness. With their flanks and throats ripped open by the wolves’ teeth, the horses collapse and are devoured, until one horse makes it into Lansing and spreads the news. Long, scary and possibly fictional stories like these became rare over the years. Bears are usually the protagonist now, as in Jon Krakauer’s Into the Wild. 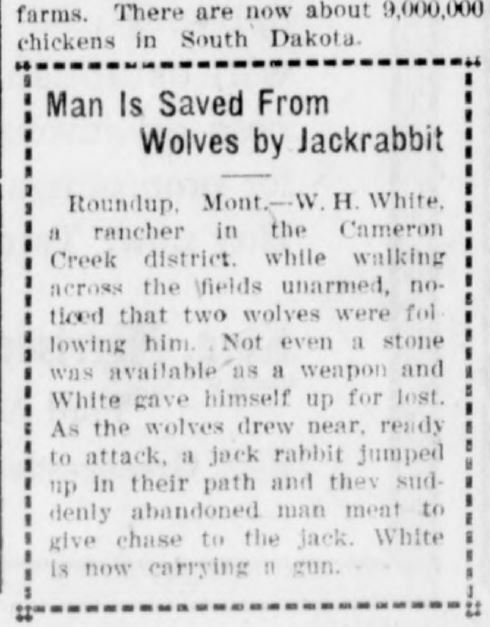 But even today, headlines still announce occasional sightings of and attacks by potentially dangerous animals in the rural Midwest. Early 20th-century readers encountered plenty of these headlines. 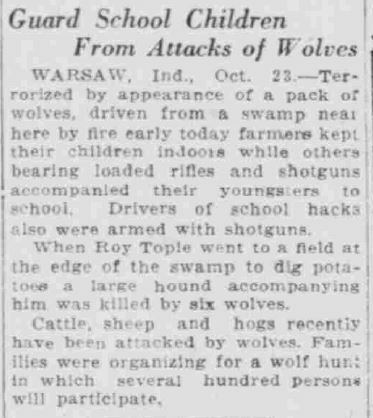 In October 1922, seven wild wolves were reported attacking livestock on a farm near Warsaw, Indiana. Farmers there were scared enough to keep their children away from school for a few days. Tall tales often bleed over into news reportage. But fact and fiction can be hard to separate. 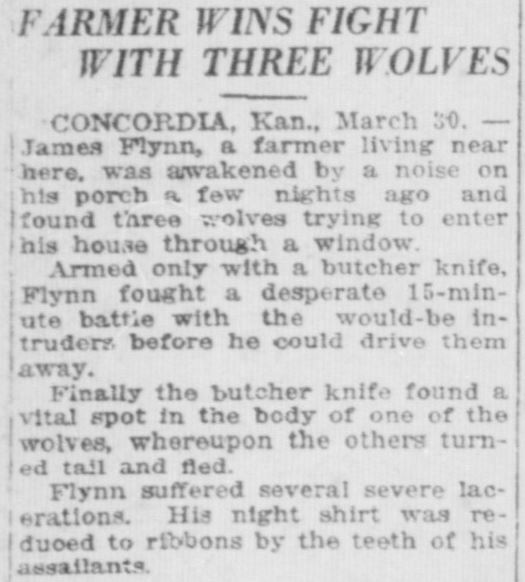 In 1920, the South Bend paper carried the story of one Kansas farmer’s desperate battle with three wolves trying to break into his farmhouse. 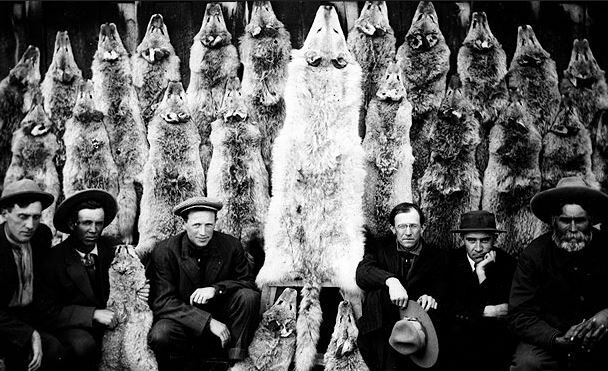 Horace E. Jackson, “a wealthy Chicago board of trade broker,” was allegedly stalked by “skulking wolves” in Minnesota’s North Woods in 1916, though exposure to the cold was an even bigger danger. 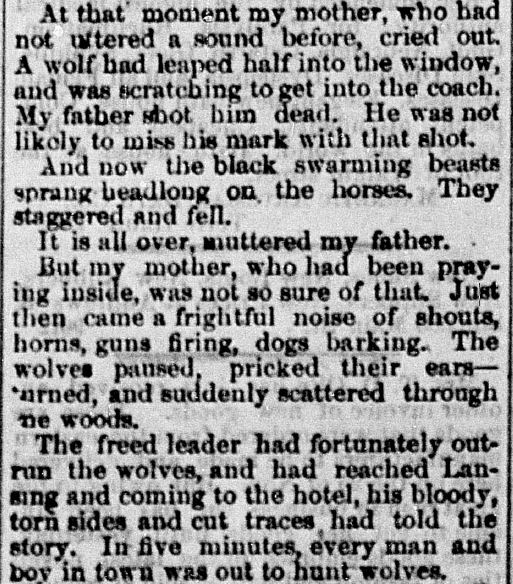 Fear-mongering news stories about wolves were partly discredited by a writer — possibly a naturalist — in the Greencastle Herald in 1913. Wolves, he reminded readers, usually fear men more than men fear them. The Indiana DNR still gets plenty of crazy phone calls about unusual animal sightings. One recent report that turned out to be true was the migratory mountain lion that was stalking parts of Greene County near Bloomfield in 2010 and has also been reported near Brazil, Greencastle, and Bloomington. The lion was photographed by one of the DNR’s motion-sensitive cameras and was originally thought to have been a tiger escaped from the Exotic Feline Rescue Center in nearby Center Point, Indiana. What the DNR shouldn’t take seriously is any reports about the Wolf family, who once lived on Notre Dame Avenue in South Bend. 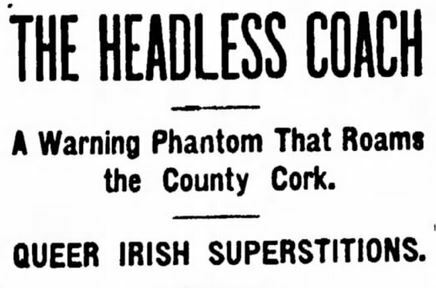 This 1920 headline sounds like another one of those grisly folktales. Several posts on Hoosier State Chronicles have focused on Indiana’s German heritage. 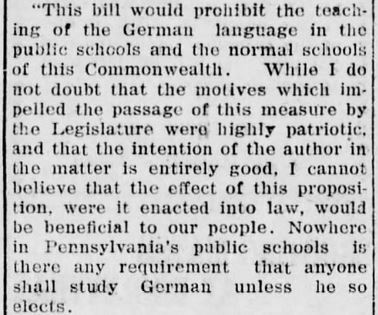 We would be remiss, then, not to examine the state legislature’s attempt to eradicate the teaching of German in Indiana schools. On February 25, 1919, three months after the armistice that ended World War I, the Hoosier State became one of fourteen states to ban the teaching of German to children, a crime punishable by fines and imprisonment. Devils and their master, the Kaiser. 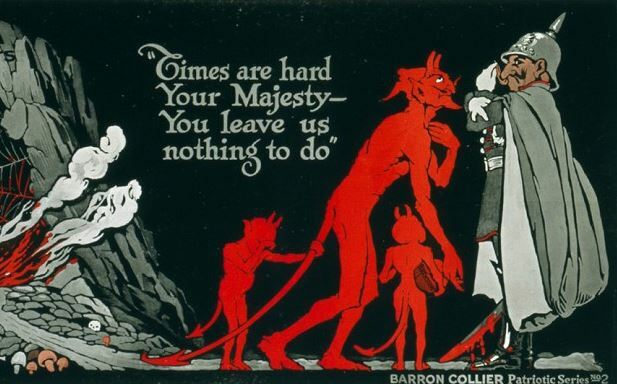 From 1914 to 1918, the U.S. and its allies in Britain, France and Italy took dehumanizing propaganda to new heights. Cartoonists, U.S. Army posters, and newspapers stoked bizarre, irrational distrust that engulfed America. The results were sometimes petty, like renaming sauerkraut “liberty cabbage” and German measles “liberty measles,” but the U.S. and Britain could also engage in acts of brutality. 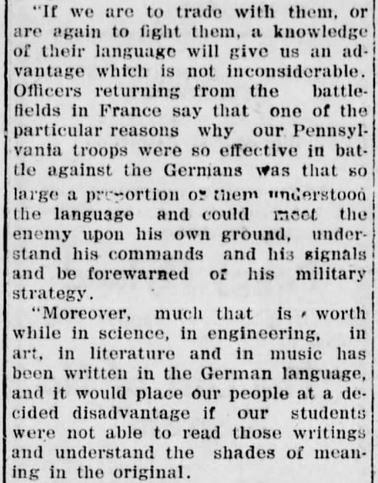 With Allied print media insisting that the Kaiser’s soldiers were bayoneting and committing other outrages, it’s easy to see how anxiety got out of hand, even in areas like Pennsylvania and the Midwest, which had large German-American populations. A sign painter in Indianapolis who opposed Gothic lettering mentioned that Americans were already burning German textbooks. At Indianapolis’ Shortridge High School, a newspaperwoman connected to the Red Cross was applauded during a speech when she criticized the administration for not canceling German classes there. The German teachers switched to teaching Latin. Meanwhile, a new course on “contemporary war history” began and a hundred students enrolled. At a time when the U.S. was claiming to oppose German militarism, Shortridge considered its military history course to be the first ever offered at an American public high school. 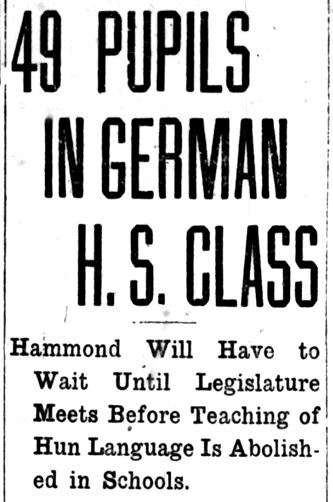 Hammond High School was already planning to phase out German by 1919 and was just waiting for the legislature to catch up. 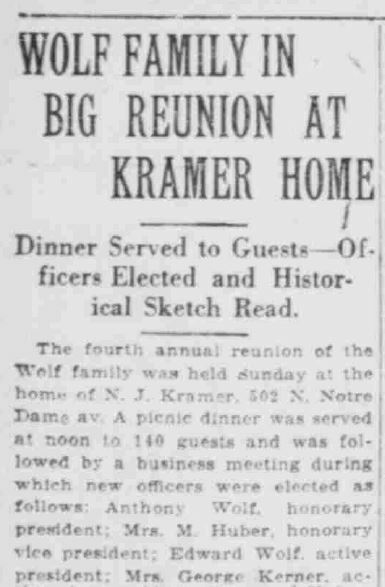 Lake County Times, September 10, 1918. Hoosier State Chronicles. On the eve of the vote in Indianapolis, a visitor from Iowa spoke at the Statehouse. Iowa’s Governor William L. Harding is considered one of the most dishonest and opportunistic politicians in American history. Though he had curried favor with Iowa’s foreign-born citizens during his election campaign, when the war broke out he turned against them. 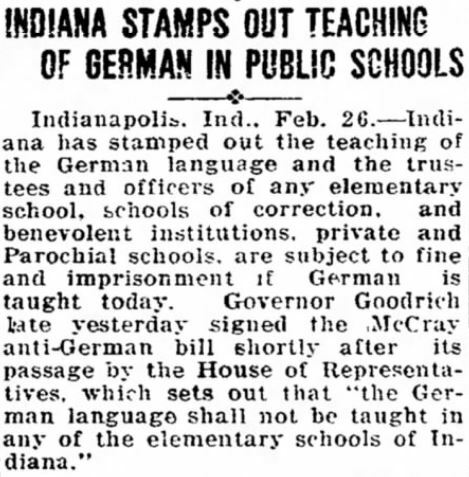 Proponents of Indiana’s German-language ban were later accused of the same kind of hypocrisy. Iowa’s William L. Harding in 1915. 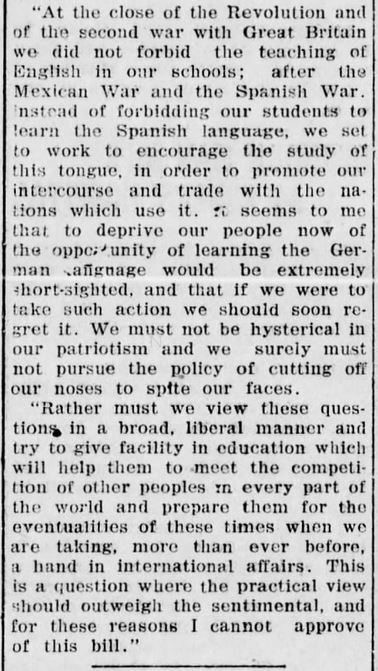 Harding’s 1918 “Babel Proclamation” in Iowa did more than simply ban German instruction, though. The infamous law banned the speaking of all foreign languages in public, including Norwegian, Swedish, Dutch and Czech, which were still common in the Midwest. 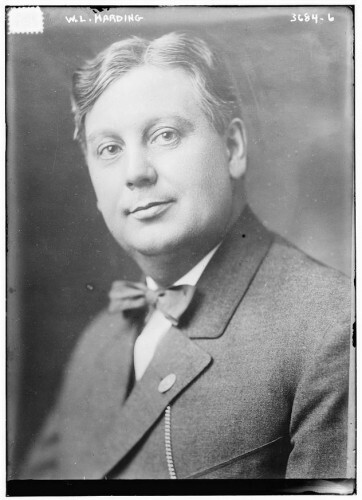 Fearing “spies,” Harding made having a foreign-language conversation on the telephone, on street corners, and in churches and schools a criminal offense. Iowa’s law was no empty threat. Violators were arrested and jailed. Harding had plenty of admirers. “Liberty Leagues” and “councils of defense” wanted laws to keep German off the streets and even ban it in private homes. 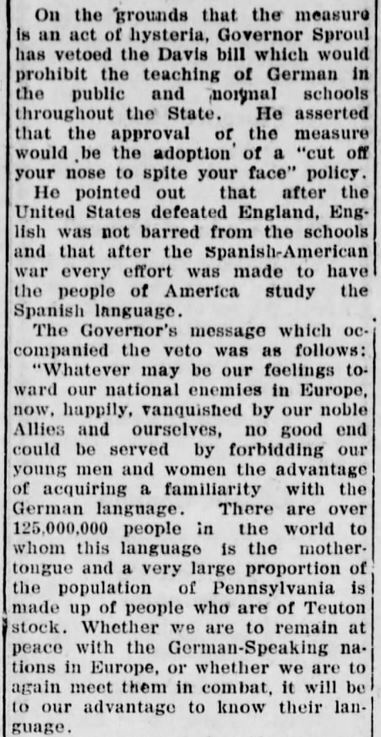 The author of the “Babel Proclamation” spoke in Indianapolis on February 13, 1919, a few days before Indiana outlawed the teaching of German in Hoosier elementary schools. Journal of the Indiana State Senate, 1919. Google Books. 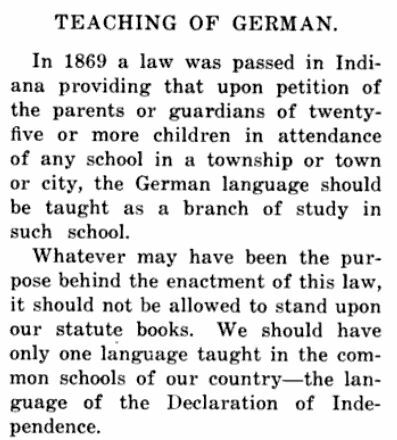 Indiana’s 1869 law likely had to do with teacher shortages and the fact that in German communities, it just made sense. One of the most glaring oversights of the anti-German law was that many speakers of the language were Mennonites and Amish, Christian pacifists highly unlikely to be working as secret agents. 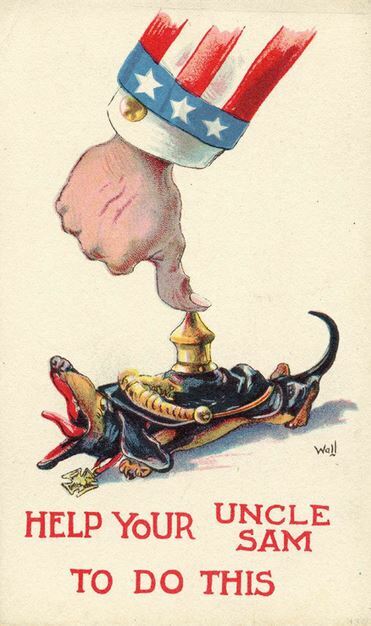 Though the German army committed real outrages in World War I and the bill’s proponents mentioned fear of “future German propaganda” aimed at American children, focusing on the atrocities of “Huns” was a sly way to pass a law that was deeply entangled with immigration, prohibition and labor unrest. As 1919 dawned — one of the most turbulent years in American history — “wet” and “dry” advocates, capitalists and socialists, anarchists, pacifists and suffragettes battled for the “soul” of the country. Many German-Americans were farmers or industrial laborers and had a history of being Socialists, pacifists and isolationists. When the Socialist Party tried to steer America away from entering World War I, arguing that American entry would play into the hands of wealthy industrialists and bankers, pro-war advocates countered that anyone who opposed the war supported the Kaiser. In 1924, Progressivist presidential candidate Robert LaFollette carried Wisconsin, a heavily-German state, partly as a result of his anti-war record. German fondness for beer and liquor also earned the hostility of many Prohibition advocates, who had spent decades slowly “shutting off the tap.” A nationwide ban on booze was just around the corner, coming in January 1920. Yet as Chicago’s Lager Beer Riot back in 1855 proved, the history of Prohibition was closely tied to anti-labor attitudes. Squelching the German language was part of the process of extinguishing German sociability at a time when workers got together in pubs and beer gardens to talk about labor grievances and organize. 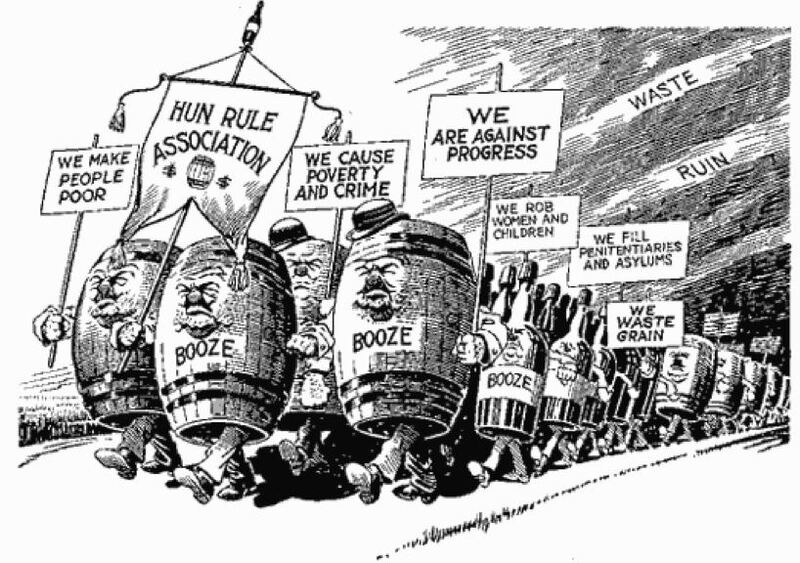 A World War I-era cartoon slanders “Huns” — Germans — as booze-lovers who cause crime, poverty and waste. 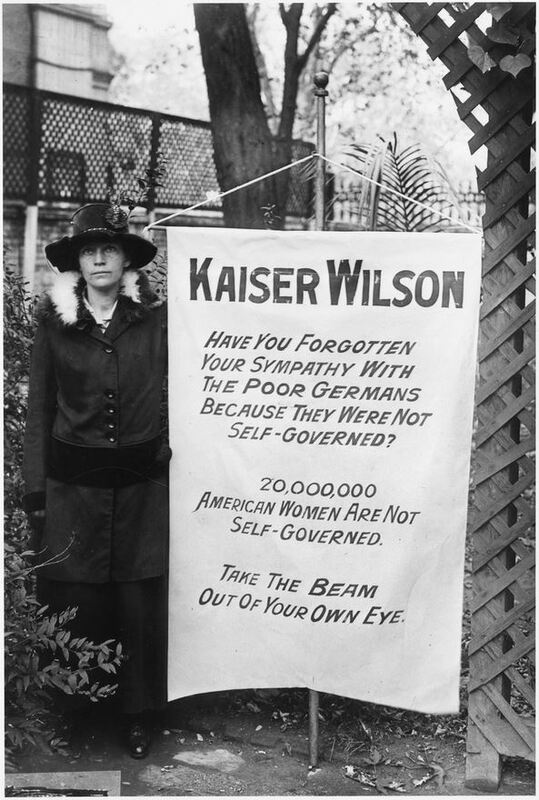 An American woman sends a message to “Kaiser Wilson” in 1916 — four years before women were given the right to vote. 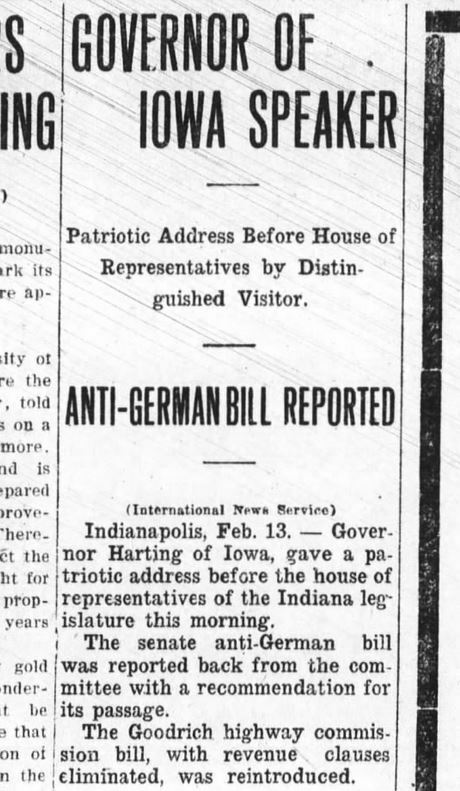 While fear of “Huns” and “traitors” prompted anti-German bills, America’s social problems were reflected in the Indiana bill. That year, Gary would be shut down by a national steel strike, a federal raid on Communists led to the deportation of hundreds of European immigrants (including Hoosiers), and an anarchist bomb plot nearly killed several major U.S. officials. 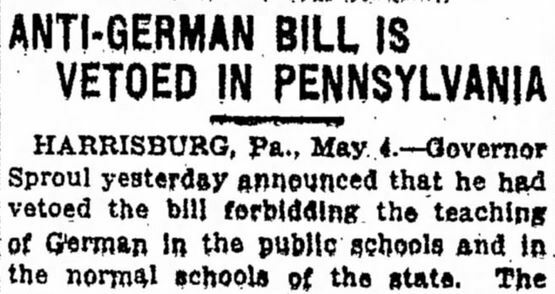 The 1919 law completely banned German-language instruction up to the eighth grade. It was followed by a law prohibiting high-school German courses. Fortunately, the men who wrote these bills recognized that at the college level, “the contributions of Germany in literature were too great to be ignored.” (Indiana University President William L. Bryan, who criticized the bills, agreed.) The penalty for instructing children in German? A fine of $25 to $100, a jail sentence of up to six months, or both. 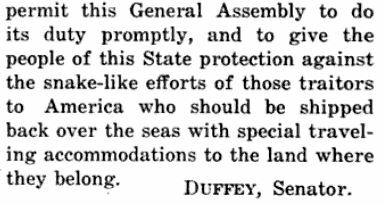 Urged by the Lieutenant Governor to enact “100 percent American” legislation, the Senate put the elementary-school bill up for a vote on February 17, 1919. Only one legislator, Senator Charles A. Hagerty of South Bend, voted against it. Yet even Hagerty’s opposition seems to have been against the political opportunism of the bill’s promoters rather than a real concern for education. On February 25, the House also passed the bill and Governor James P. Goodrich signed the legislation. Ironically, the anti-German bills were overturned in 1923 by another man named McCray — Governor Warren T. McCray, who also butted heads with the Klan. A few months after Governor Goodrich signed Indiana’s law, an anti-German bill passed through Pennsylvania’s legislature, also by a large margin. Pennsylvania Governor William C. Sproul, however, vetoed it. Sproul’s remarks to the press were probably the most intelligent words to come out of the whole debate. Hoosier State Chronicles has digitized over 8,000 issues of the Indiana Tribüne, once a major German-language newspaper. Published by The Gutenberg Company in Indianapolis, the Tribüne was silenced on June 1, 1918. In 1858, Terre Haute, Indiana, was beginning to have an odd distinction: bite victims from all over the Midwest were coming here for a cure. That year, Isaac M. Brown, editor of the Terre Haute Daily Union, suggested to the city council that the town purchase for public use a “madstone,” a curious leech-like hair ball found in the guts of deer — preferably an albino buck. 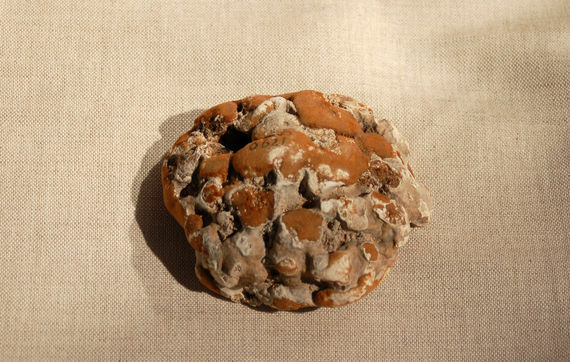 For centuries, folk doctors on both sides of the Atlantic believed such madstones to be helpful in warding off rabies infections and healing poisonous bites. (Queen Elizabeth I of England apparently kept a madstone hanging around her neck.) To back up his support for this public health measure in Terre Haute, Brown quoted a letter from the Mount Pleasant Journal in Iowa, which tells the wild story of one settler there, Seth Stanton, bitten by a rabid feline at his home near the Missouri state line. On the morning of the 15th of March last I arose early, walked out to the gate in front of my house where I was attacked by a mad animal — a mad cat. It sprang upon me with all the ferocity of a tiger, biting me on both ankles, taking a piece entirely out of my left ankle, clothing flesh and all. [Perhaps it was a wildcat, not a domestic creature. Stanton is not specific.] I saw at once my hopeless condition, for the glairing eyes of the cat told me at once that it was in a fit of hydrophobia. I at once resolved to start forthwith to Terre-Haute, Ind., expecting there to find a mad stone. Accordingly in a few hours, myself and wife were under way, crowding all sail for that port. [I] drank no water for eight days. The stone was promptly applied to the wounds. It stuck fast as a leech until gorged with poison, when it fell off volunteerly [sic]. It was then cleaned with sweet milk, salt and water, and was applied again, and so on, for seven rounds, drawing hard each time, when it refused to take hold any more. — The bad symptoms then all left me, and the cure was complete, and I returned to my family and friends with a heart all overflowing with thanksgiving and praises to God for His goodness and mercy in thus snatching me from the very jaws of death. American medical history is full of strange tales and oddball personalities. In some cases, medicine and folklore come together. Though my family has lived in Terre Haute since the mid-1800s, I certainly had never heard anything about a famous “madstone” there. 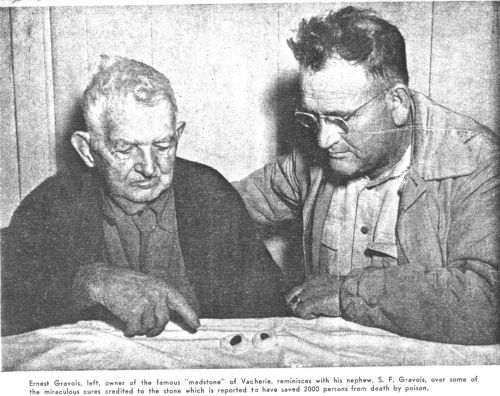 The “Terre Haute madstone,” however, shows up over several decades in American and even Canadian newspapers. At one time, journalists made Terre Haute out to be a virtual “madstone” mecca. Madstones definitely weren’t Blarney Stones, and people who came looking for them weren’t tourists. Madstones, it turns out, weren’t even rocks at all. Once used as part of a rare but geographically widespread folk medical practice, they are also termed bezoars in both folklore and medical science. Categorized according to the type of material that causes their formation — usually milk, seeds, or plants mixed with an animal’s own hair from licking itself — bezoars are calcareous masses found in the gastrointestinal tracts of deer, sheep, goats, horses and even walruses. In folk usage, these masses were mistaken for actual stones, sometimes polished to look like beautiful grey hen’s eggs, and often thought to have nearly-miraculous properties. 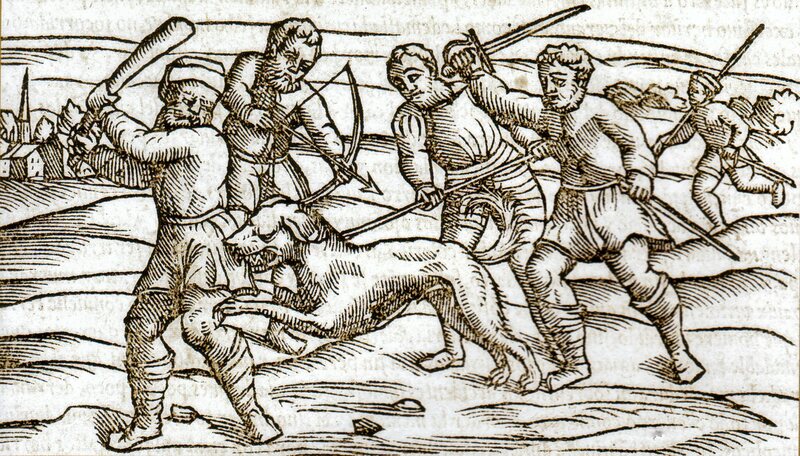 Frontiersmen believed that when applied to the bite of a rabid animal, and in some cases even that of a poisonous snake, madstones could draw out the rabies virus or poison before the tell-tale symptoms set in. Rabies is almost always fatal and one of the worst ways to die. Victims of the infection will suffer from extreme, deathbed-splintering spasms as the virus wreaks havoc on the nervous system. Hydrophobia, characterized by frothing at the mouth and intense fear of water, follows from the inability to swallow. According to Dr. Charles E. Davis in The International Traveler’s Guide to Avoiding Infections, the World Health Organization knows of only one case of a human with rabies escaping an excruciating death once the virus reached the brain. On the mad dog. 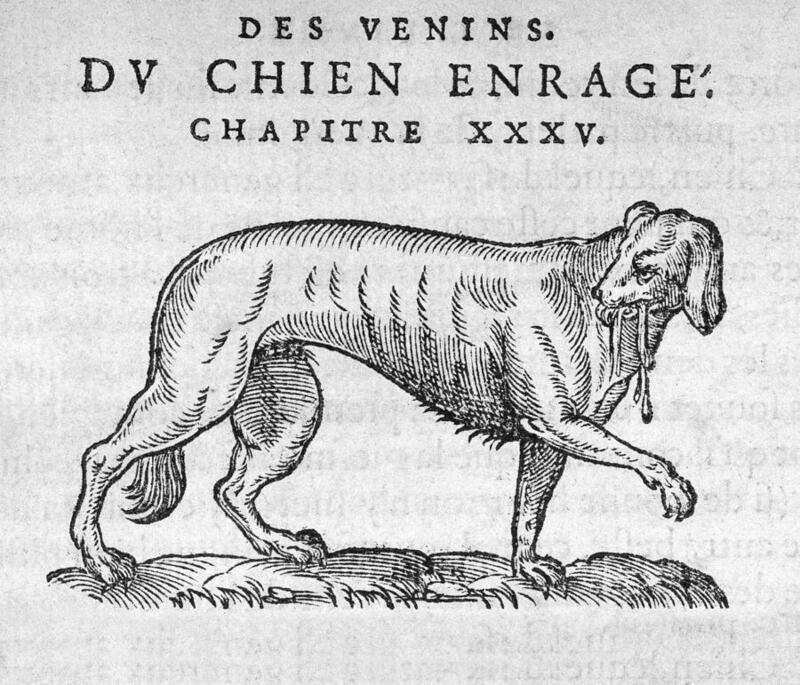 From a Renaissance-era French medical book about poisons. While the madstone has been thoroughly debunked, one can hardly fault the practitioners of early madstone “medicine” for giving it a go. In some parts of America, use of these stones lingered on into the 1940s. One of the better pieces of writing about American madstones appeared in the Summer 1983 issue of Bittersweet, a magazine published by high-school students in Lebanon, Missouri. Called the “Foxfire of the Ozarks,” Bittersweet was a spin-off of the hugely popular books written by students in Georgia in the early 1970s. Based on interviews with Appalachian and Ozark old-timers, Foxfire and Bittersweet were a major spur to the countercultural back-to-the-land movement that came about during the days of the Vietnam War. In “Madstone: Truth or Myth?” student Dena Myers looked at the old folk belief, once common far outside the Ozarks. She tapped into a vast repertory of tales claiming the stone’s effectiveness. People using the madstone for treatment boil the stone in sweet milk, or sometimes alcohol. While still hot, they apply the madstone to the wound. If the victim has rabies, the stone will stick to the wound and draw out the poison. Once the stone adheres to the wound, it cannot be pulled off. After the stone is filled with the poison, it drops off by itself. It is then boiled again in the milk which turns green the second time. The process of boiling and applying is repeated until the stone no longer sticks to the wound. French scientist Louis Pasteur pioneered a rabies vaccine in the 1880s, but its side-effects were so terrible that many people avoided it. (“Some Ozarkians say they would rather use the madstone than take the shots,” Myers wrote.) References to a “Pasteur treatment” or “cure” at the turn of the century are misleading. Once symptoms appear, “treatment” for rabies can do little but lessen the agony of death. 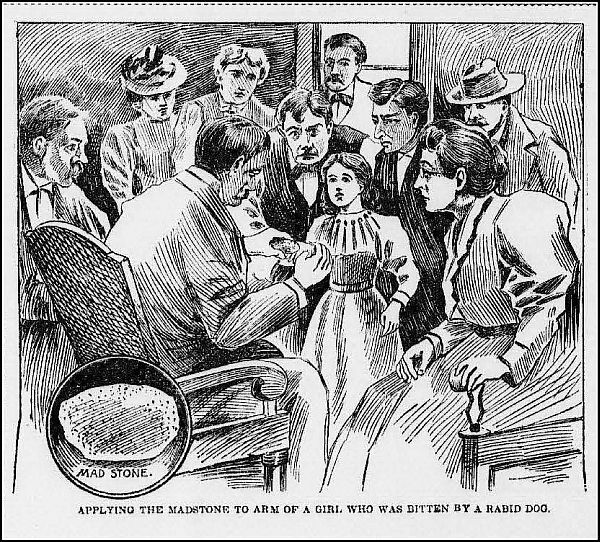 Those who “recovered” from rabies after a madstone treatment never had it to begin with. Fred Gipson’s novel Old Yeller, set in the Texas Hill Country around the time Pasteur was working on the first rabies vaccine, captures the real tragedy of the disease, which was common before vaccines, muzzling and the “destroying” of animals brought it under control in developed countries. In the U.S. today, rabies rarely occurs in dogs and cats, but still occasionally shows up in bats, who transfer it to livestock, pets, and humans, often un-vaccinated spelunkers. The Cajuns in Louisiana practiced madstone healings. (Many Cajun folk beliefs came from African Americans and American Indians also inhabiting the bayous.) A stone yanked from the gut of an 18th-century Russian elk ended up in Vernon County, Missouri, on the Kansas state line, sometime before 1899. 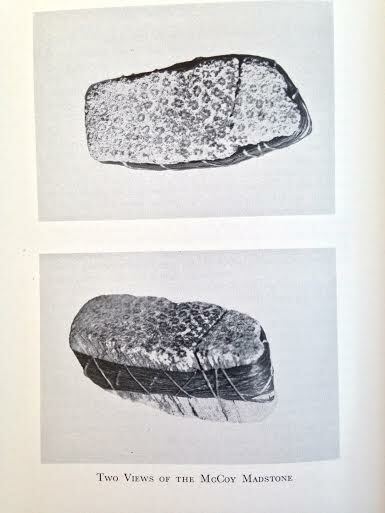 A madstone used in St. Francis County, Arkansas, in 1913 was dug out of an ancient Indian burial mound. One of the first European practitioners of madstone healing in Indiana was John McCoy, an early settler of Clark County. 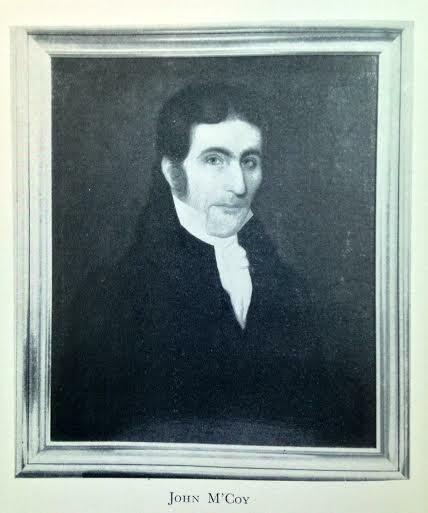 John McCoy is best known for leading the Charlestown militia after the Shawnee attack on settlers at Pigeon Roost in 1812, one of the bloodiest events in Indiana history, which happened near his home. (Ironically, McCoy was the brother of the Rev. Isaac McCoy, a Baptist missionary and land rights advocate for the Potawatomi and Miami. When they were evicted from Indiana in 1838, Rev. McCoy accompanied them to Kansas and Oklahoma.) A deacon in the Baptist Church himself, John McCoy helped found Franklin College at a time when “Baptists were actively opposed” to higher learning, Hayward wrote. What is less well known is his battle against rabies in southern Indiana. McCoy kept a laconic record of his days. On at least ten occasions recorded in his diary, he was called on to apply his wife Jincy’s madstone to victims of animal bites. McCoy applied the stone, carried up from Kentucky, long after Clark County, Indiana, had ceased to be a frontier zone. Most of his diary entries related to its use date from the 1840s. April 9 . Sunday. At sunrise attended prayer meeting. 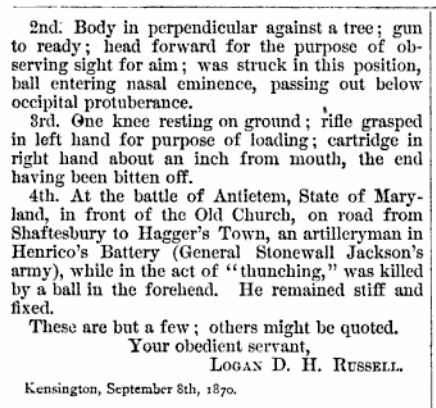 At 11 attended preaching, afternoon detained from church by having to apply the Madstone to a little boy, bitten the day before. At night attended worship, then again attended to the case of the little boy till after 12 o’clock. Yet around the same time John McCoy was practicing his primitive form of medicine near Louisville, Terre Haute was becoming a top destination for those seeking treatment — or at least reassurance. Mary E. Taylor, almost always referred to in newspapers as “Mrs. Taylor” or “the widow Taylor,” was the owner of the famous “Terre Haute madstone” mentioned in many American newspapers. Her stone’s virus-sucking powers were sought out from possibly the 1840s until as late as 1932. 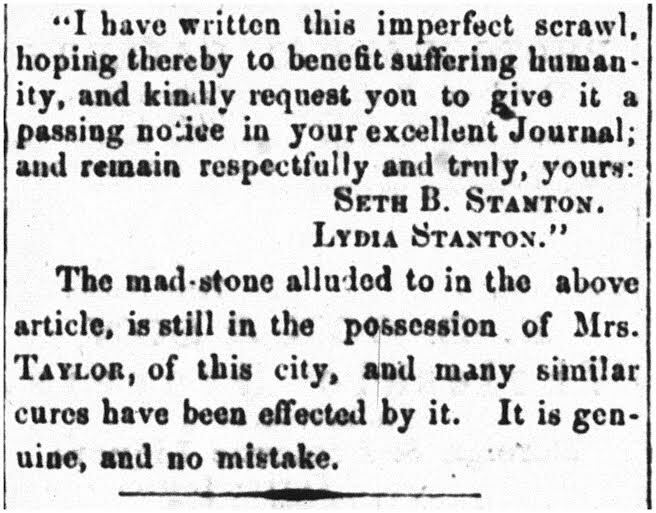 In 1889, Mrs. Taylor spoke about the provenance of her madstone to a reporter. “My mother’s brother had it in Virginia,” she told the Terre Haute Saturday Evening Mail, “and as he had no children gave it to my mother. That is as far back in its history as I can go.” An 1858 letter from Mary “I.” Taylor (possibly a misprint) appeared in the Evansville Daily Journal. She claimed the stone had been in use “for the past thirty years” in Vigo and Sullivan counties. The Terre Haute Weekly Express claimed the madstone came to Indiana via Kentucky, after the Murphys lived there for a while in their move west. Though Mrs. Taylor might have been widowed as early as the 1840s, hoax-busters who would suggest that she used her family’s madstone to support herself should remember the prominent superstition that warned against accepting payment. 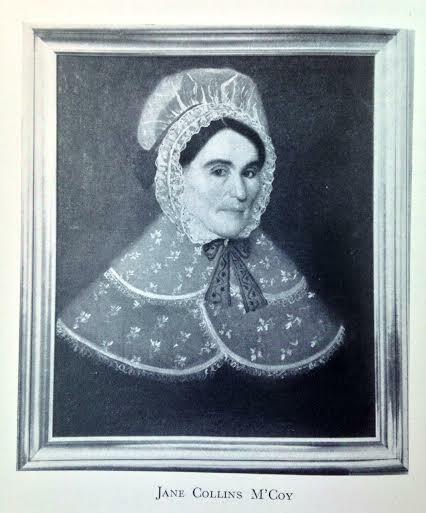 A “widow lady” whom McCormick thinks was Mary Taylor “cured three cases” of hydrophobia in early 1848, according to the Wabash Express. During the decades when John McCoy and Mrs. Taylor were folk medical practitioners in the Hoosier State, Abraham Lincoln, according to an old claim, brought his son Robert to Terre Haute to be cured of an ominous dog-bite. Max Ehrmann, a once-renowned poet and philosopher who lived in Terre Haute, investigated Masters’ claim in 1936. At the famous hotel called the Terre Haute House, Ehrmann had once heard a similar story from three of Lincoln’s political acquaintances. They told Ehrmann that sometime in the 1850s, Lincoln, then still a lawyer in Springfield, brought Robert to Indiana for a madstone cure. Father and son stayed at The Prairie House at 7th and Wabash, an earlier incarnation of the famous hotel. A sister of Mary Todd Lincoln, Frances Todd Wallace, backed up the story. “I have never been able to discover who owned the mad-stone,” Ehrmann wrote. “It was a woman, so the story runs.” If true, Robert (the only child of Abraham and Mary Lincoln to survive to adulthood) would have been a young child or teenager. He lived to be 82. 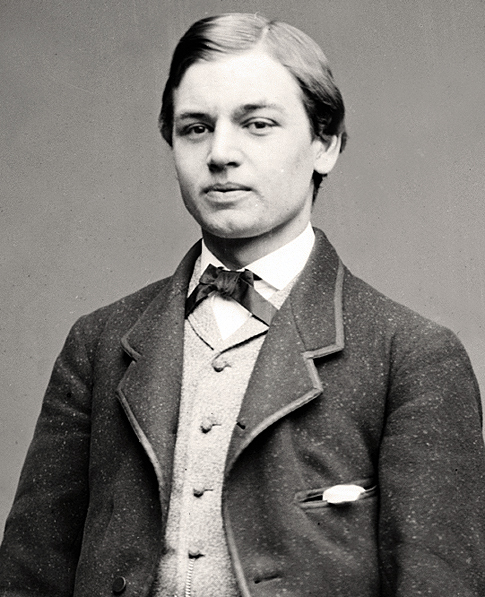 Robert Todd Lincoln may have come to Terre Haute for a rabies “cure” in the 1850s. 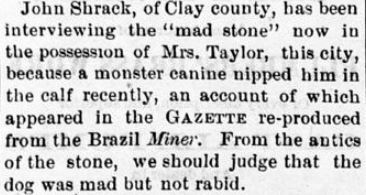 Mrs. Taylor’s “Murphy madstone” was probably just one of three such stones in Terre Haute that offered a rabies cure. Another was owned by Rev. Samuel K. Sparks, and Mary E. Piper’s “Piper madstone” was used until at least 1901. We know it is wicked to do so, but we almost wish our friend Harding would receive a good dog bite, in order that his skepticism as to the efficacy of our madstone might be cured. Although he may have more faith in whisky, which is said to be an antidote for some poisons, we’ll bet the first train would convey him in the direction of Mrs. Taylor’s residence. Terre Haute, Ind., August 18 — William Painter, a farmer, died of hydrophobia from a cat bite, and in a moment of consciousness before the final convulsion, caused his attendants to tie him in the bed for fear he would do someone harm in his struggles. The death convulsion was so strong that he tore the bed in pieces, but no one was hurt. He was bitten June 21 by a cat which had been bitten by a dog eight days before. He called the cat to him and as it sprang at his throat he caught it and was bitten in the thumb. He had the Terre Haute madstone applied, and as it did not adhere he felt that he was not infected with the virus. Skeptics and scientists, of course, eventually established that saliva is what carries the rabies virus, and that if bitten through clothing, one was far less likely to be infected than if bitten directly on the skin. Also, not all animals thought to be rabid actually were. The mental relief of receiving the “cure” from the likes of Mrs. Taylor probably helped the healing of non-rabid wounds and infections by calming the mind, thereby boosting the immune system. (What the green stuff was that came out of the madstones, I have no idea.) Though mention has been made of bite-victims having recourse to madstones as late as the 1940s, they practically drop out of the newspapers around 1910. The Pasteur treatment is the only one for rabies. “Mad stones” are pure folly. Faith in such things does not belong to this century. If a person is bitten by a dog known to be mad we urge such to immediately go to take the Pasteur treatment at Chicago or Ann Arbor. Indiana has no Pasteur Institute, and this reminds us of the admirably equipped and well conducted institute in Mexico City. In the land of the “Greaser,” unlike enlightened and superior Indiana, any person bitten by a mad dog can have scientific treatment for the asking. It is to be hoped that the State having “the best school system” will some day catch up with “the Greasers” in respect to having a free public Pasteur Institute.